What are the real capacities of local governments to implement the Sustainable Development Goals (SDGs)? The Global Observatory on Local Finances is an essential tool to raise awareness and strengthen the dialogue among the international community and central and local governments, in order to improve fiscal decentralization worldwide. The UCLG World Congress in Bogotá will see the launch of the first edition of this Global Observatory, an essential tool for the follow-up of local government financial capacities to implement the SDGs. Achieving the SDGs means that a huge effort must be made in terms of improving infrastructures and public amenities. According to previous studies, the amount of funding dedicated to investments should be, on average, doubled or even tripled over the next 15 to 20 years. With the general process of decentralization, local governments are currently on the front line when it comes to meeting the needs of the population, supporting economic growth, and implementing the necessary mitigation and adaptation strategies to face climate change. The UN Secretary General himself stated that many of the investments to achieve the SDGs will be led by local authorities, but do they have the financial means to do so? In most developing countries, the answer to this question is clearly negative. A quick look at the instruments available to local governments emphasizes the structural imbalance between local governments’ resources and the responsibilities devolved to them. The allocation of national revenues between the various levels of governments remains unfair, at local governments' expense. This situation jeopardizes the achievement of the SDGs, and the international community must therefore adopt steering and monitoring tools to assess the financial capacities of local governments to develop their territories. Today, many initiatives are underway to make an inventory of financial information, but they do not provide a global overview of local governments worldwide. At the national level, many countries do not have their own reporting system, to enable them to structure dialogue between central and local levels of government on one hand and, on the other hand, to effectively follow up the progress of urban development. Further, aggregated global data that is currently available either does not allow for an appraisal of the concrete reality of fiscal decentralization systems, or does not take the local level into account, dissociating local finance from their broader contextual framework. The draft of the New Urban Agenda refers many times to the urgent need for transparency and dialogue between levels of government, as well as of reliable data, and the role UN agencies and international partners have to play in the monitoring and reporting of the development goals. On the eve of the Habitat III Conference, local and regional governments, international organizations, the academic world and representatives from international donors will meet at the UCLG Congress in Bogotá to discuss how to finance the investments necessary to implement the objectives of the New Urban Agenda. 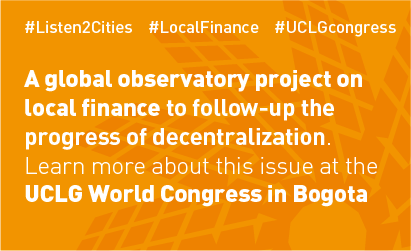 In line with UCLG activities on decentralization, development and local democracy, this Congress will unveil the first edition of the Global Observatory on Local Finances. Realized in partnership with the OECD, with financial support from the AFD, it aims to provide a comparative statistical database with local finance indicators in all continents, and to create a global network of experts, made up of chief financial officers of cities in particular. We invite all UCLG members, representatives from local and regional governments and their financial directors, academics, finance stakeholders, and all those interested in sharing their experiences, to contribute to the political dialogue on Financing the New Urban Agenda that will be held in Bogotá during the World Summit of Local and Regional Leaders and the UCLG World Congress.